« Tortoise & Hare Teach Tempo & More! Class brainstorming sheet with ideas about cheetahs. A happy collision of ideas produced a great surprise for one of my classrooms of six- and seven-year-olds – a metaphor! As I have done for several years in the spring, I am working with six classrooms of first grade students at the Condon School in South Boston to write class songs. Each student submitted ideas for their class song. I asked people to consider topics in science or social studies. Most of the students chose topics from the world of science. In some classrooms, a number of people seemed to coalesce around the same idea. Many kids in one room favored ladybugs. Another class had many fans of Neil Armstrong and his walk on the moon. In another class, a particular student was such a fan of ancient Egypt that we felt compelled to choose his idea. 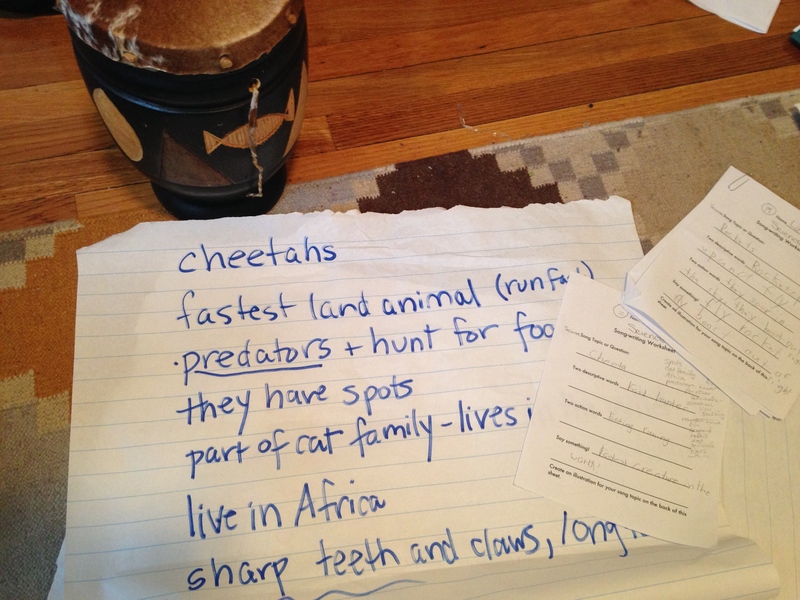 But in one classroom, the ideas were all over the map: tigers, cheetahs, dogs, the moon, stars, and a lone nomination of Sonic the Hedgehog (fictional characters were discouraged). Among several of the papers, I found a common thread: the students who liked creatures liked the ones who can go very fast. Another paper surfaced in the same class on the topic of shooting stars. At the bottom, the student had written, “a cat.” I asked if she was trying to make a connection between a cat and a star. She said no, it was just a mistake. Okay, technically that’s a simile. I didn’t get into the finer points. I beefed up the content by sharing a bit of Internet research on the fastest creatures on land, in the air and in water. We soon found that a peregrine falcon, who can move fastest of any creature, can dive for prey at over 200 miles per hour. Yowzah! Many students were fans of the cheetah, the fastest land animal. The black marlin is the fastest sea creature. We brainstormed about these creatures, with me jotting down all the students’ ideas and helping to turn them into rhyming lines. Soon, a new song was born. I hope to post a good recording soon.